Look and Be: March 31/April 1st Extra Ordinary Blog - no joke! March 31/April 1st Extra Ordinary Blog - no joke! As winter melts into spring this month, I’d love to share the extra-ordinary adventures of a fellow library worker. 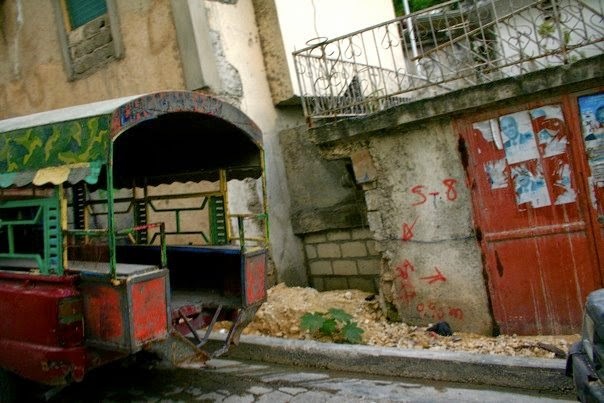 Her photos from the mission trip she took to Haiti inspire me to keep writing my novel based in the sea. Her creativity in working with local teens motivates me in my own endeavors with the wee ones of the library. Q) You seem to love working with teenagers, what with being an advisor for your youth group and holding a full-time job as teen librarian. It’s a tricky age, 13-19. What made you want to work with that age group? A) I was very active in my church's youth group when I was in high school. The best parts of it for me were the close relationships I had with my fellow peers, and also with our adult advisors. I remember thinking it was so cool that grown-ups who were not related to me and not from school wanted to spend time with us, with me. The care and love I felt was incalculable, and it was my first taste at what it was to feel a part of something bigger than myself, a part of a community of like-minded individuals and I wanted to give back by becoming an advisor myself. The tricky part of this age group, is you feel both alive with discovery and utterly alone. I remember how confusing of a time it was and I also remember how significant it was to have a non-parent, non-teacher adult to turn to during the low points. My role as an advisor and a librarian puts me in a unique position to help. Also, it allows me to be as goofy as I want and to wear blue nail polish to work. Q) What was your groups’ purpose on this mission trip? A) The trip was a scouting trip. Our church has partnered with an experimental school in Cité Soleil, one of the country's most dangerous and impoverished slums. The Cité Soleil Community School is the only free school in the city. Two hundred lucky children are given a safe haven a couple hours a day and nourishment for their hungry stomachs and minds. This school will give them the knowledge and skills they will need to not only survive but also thrive. 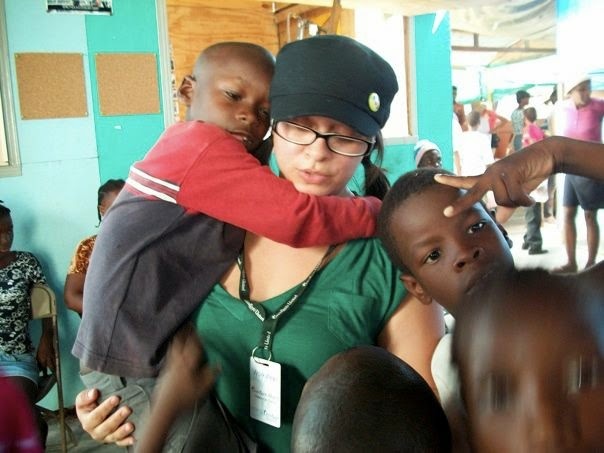 Q) What was it like being a youth leader on a mission trip to storm ravaged Haiti? A) For the first time in years, I was actually the youngest person on this particular mission trip. Because it was only a scouting trip, I was one of six individuals selected to go and help foster relationships with other volunteer organizations, the staff of the school, and more importantly: the kids. While we did not bring any youth with us, they were constantly on my mind. Q) What was the highest and lowest point you experienced on this trip? A) The highest and lowest point of my trip were both one in the same. Escorted by Julie, a fellow American volunteer, and three very large Haitian security guards, we set off on our tour of the streets of Cité Soleil. We were led past homes made of cinder blocks and tin sheets patched up with old scraps of wood or tarps. We were led down alleyways, meeting an assortment of people including the local leather smith making decorative sheaths for giant machetes. We were led further and further down the twists and turns of the streets, in-between houses and the passageways seemed to be getting narrower and narrower. Slowly I grew more and more concerned for my safety and as I was about to start hyperventilating a little boy, no older than three, wearing only a pair of ratted Winnie the Pooh overalls, suddenly came running around the corner right up to me and hugged me around the waist. He looked up at me with these huge beautiful, brown eyes, smiled and simply took my hand. That opened up the floodgates. The floodgates to not only my heart but also to the floodgates holding back a sea of tiny little children barely able to walk, barely clothed, barely inhibited. The further we walked down those alleys the narrower they got-but this time due to the swarming kids coming to hold our hands and walk with us. I soon found myself with at least three little hands holding each of my own and quickly realized I was no longer overcome with fear. Instead I felt overcome with hope and serenity. And the love I felt was instant. I wished desperately that I could take all of them home, that I could care for them and clean them and give them safe places to sleep. But I realized that I could not give them a different life no matter how hard I wished it. It was then that I understood the true importance of the school, of an education. Q) Would you ever go back? Why or why not? A) Going on this trip and working with those kids had been the single most eye-opening, heart-breaking, incredible trips I’ve ever been on. All the wonderful children at the school welcomed us with open arms. There seemed to be no looks of confusion or hostility-which we often met elsewhere. There was only excitement and curiosity. They simply wanted to connect with us and were so unafraid and sweet that any inhibition I had quickly melted away -- melted with a warmth that did not come from the sweltering temperatures but from their acceptance and desire to learn. Would I go back? In a heartbeat. Q) How did this trip influence your decision to become a teen librarian? A) It was empowering and motivating to see the desire to learn in those children’s eyes. Before my trip, I had been toying with the idea of getting an MLIS degree. There’s nothing in the world quite like going to a third world country and realizing exactly what you want. I wanted to help. I wanted to make a difference. I wanted to learn about the accessibility of information and the distribution of resources. Despite spending my undergraduate career studying to be a photographer, I felt studying library science was the next step in my search for growth. I realized that what I loved most about photography was the documentation and preservation of a moment in time. And that’s exactly what books are -- just with words. And although I enjoyed the study and practice of photography, working in the art world just wasn’t for me. And now, I’m working in an environment I am passionate about and get to learn something new every single day. Q) As a librarian, there are way too many stereotypes about library workers. What are some of the stereotypes you try to bust with the students? A) First and foremost, I want the kids to know that I don't know everything. No one does. I want them to know that it's okay to not have all the answers all the time but instead to strive to gather as much information as possible in order to make an informed decision. And also that all I do is read when I go home at night. While I do make some time for reading, I'm a big fan of binge watching TV shows on Netflix and watching horror movies. Q) Since you’ve become a full-time teen librarian, you have revolutionized that department, offering so many possibilities to teens: volunTeens, Anime Club, Books 2 Box Office, Teen Book Chat, Video Game Hangout, Poetry Slam, Teen Advisory Group, drop-in activities (the list goes on.) How do you come up with all these ideas? A) I get some ideas from fellow YA librarians and (guiltily) some from Pinterest but most of my program ideas come directly from the kids themselves. Q) Thanks for taking time out of your really busy schedule to share your extraordinary life with us! One last question - what is one thing about you that no one would suspect, whether it be ordinary or extra? A) I have four tattoos. Thanks, Lauren, for sharing your photos and yourself with us! This wonderful Extra Ordinary blog was posted on April 1st, 2015 from the USA. If you know someone who would like to share his/her Extraordinary Ordinariness, please email me at soulfixer13 at yahoo dot com (RE: EO blog) or leave a comment. www.lookandbe.blogspot.com is a once-a-month blog highlighting the extraordinary adventures of ordinary folks like you and me.